Another browsed blog, another challenge found. Play Date Cafe Challenge #118. You might wonder how I have time to browse all these blogs and make all these cards with 4 kids and a job and a house, and a husband, and so on? Or you may not! This card was finished after my kids went to bed. I started it while they were in the craft room with me. We were making their school valentine's cards together. I made the flowers that went on top and then got STUCK. I decided to step away rather than hurt the card even more than I already had (notice the wrinked flowers), hehe. When I came back to it, I decided to embrace the distressed look and sprayed it with blue tattered mist. Then came the sayings off to the side. The stamped sentiment didn't go on as clear as I would have liked, but then I got to thinking that it could just be part of the distressed look? yeah, that's right, it was INTENTIONAL, yep, sure was! Oh, and thank God for smart phones, so when I get trapped having to watch Wizards of Waverly Place on Disney, I can still snuggle with my kids and view my dear blogs. I guess that's called multi-tasking?? I have another submission for this challenge, see you tomorrow! I think if you look up mom in the dictionary it says multitasker ~HA! What a fun card, cute idea! 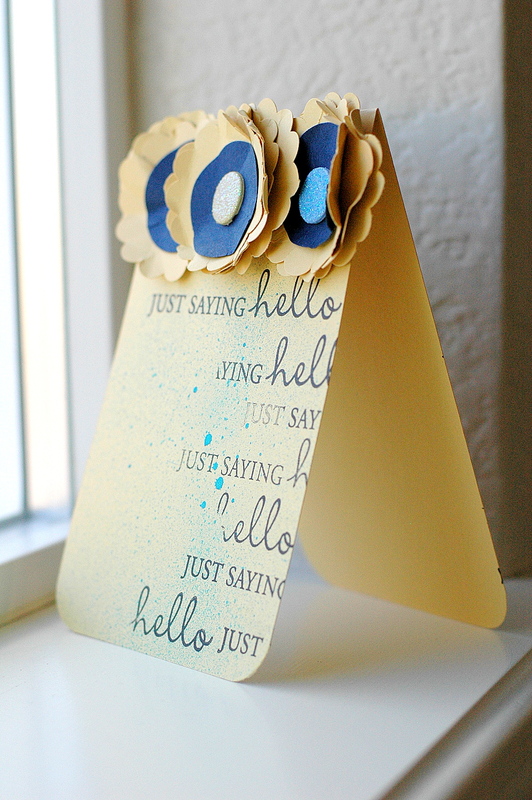 Fabulous card, and i'm totally loving that misting action! Thanks for playing along with us at The Play Date CAfe!